Good news for unemployees .. On the occassion of Telangana Formation Day Telangana sarkar issued Group IV Notifications to fill up the Group-4, VRO, ASO jobs , Junior Assistant Junior Steno Typist Posts in Various Departments of Telangana Government . 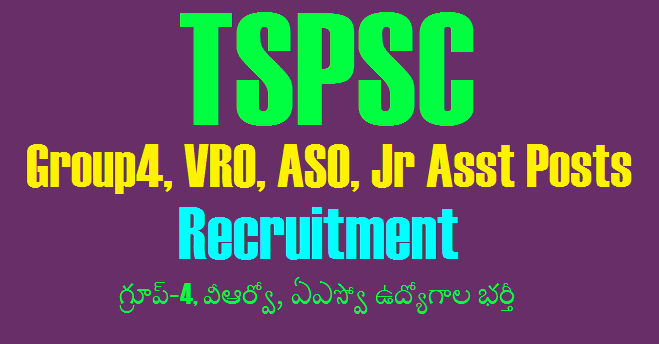 Telangana VRO VRA Notification 2018 Apply for TSPSC VRA/VRO TS Revenue Dept Jobs. Gift for Telangana formation day to unemployee youth in Telangana State. Group -4, VRO, ASO, Junior assistant jobs recruitment statement announced by Telangana State Public Service comission to release for several job recruitments during the state formation day i., on 02-06-2018. A total of 2,786 Group-4, VRO, and ASO posts will be issued by the TSPSC on 2nd June 2018. In that Group-4 posts are 1,521, Junior Assistant posts in RTC 72, ASO 474 posts, VRO 700 posts, Senior Steno 19 posts in the Revenue Department, These are the details of the posts that will be recruited by sections. Ld, Jr. Steno 15, Typist 292, Jr. Assistant 217 in the Revenue Department, Junior Assistants in Panchayati Raj Department 53, Typist 64, Junior Assistants in Commercial Tax Department 231, Junior Assistants in Forest Department 32, Junior Assistants in Home Department 22, Senior Stenos 6, Junior Steno 335, Typist 79 Posts. 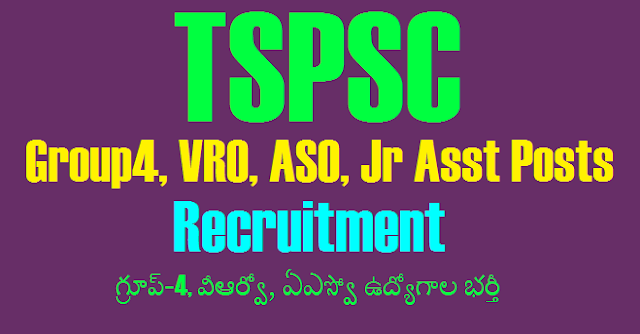 Aspirants are recently searching for these job notification on google as How Many Vacancies in TSPSC Revenue Department?, TS VRO, VRA Recruitment Notification Apply Online, Eligibility , Exam Dates, Syllabus , Question Papers, exam Pattern PDF Download the eligible candidates for the Village Revenue Officer (VRO) and Village Revenue Assistant (VRA) Posts. Aspirants who passed the 10th Class / 12th Class are eligible to proceed further for the TSPSC Group4, VRO, ASO Jr. Assts Recruitment. Applicants have to visit the official web portal tspsc.gov.in to apply online. Candidates are advised to download the notification and use it to check out the requirement details like eligibility criteria, educational qualification, age limit, pay scale, application fee etc. ఉద్యోగార్థులకు శుభవార్త. రాష్ట్ర అవతరణ దినోత్సవం సందర్భంగా పలు ఉద్యోగ నియామకాలకు ప్రకటనలు విడుదలయ్యాయి. గ్రూప్-4, వీఆర్వో, ఏఎస్వో ఉద్యోగాల భర్తీకి ప్రకటనలు వెల్లడయ్యాయి. మొత్తం 2,786 పోస్టుల భర్తీకి టీఎస్పీఎస్సీ రేపు నోటిఫికేషన్ను విడుదల చేయనుంది. రెవెన్యూశాఖలో సీనియర్ స్టెనో 19 పోస్టులు. విభాగాల వారిగా భర్తీ చేయనున్న పోస్టుల వివరాలు ఈ విధంగా ఉన్నాయి. The exam syllabus and exam pattern for TS VRO VRA posts will be available for download in the official website of the authority. Exam pattern and exam syllabus will be available for download in the official website of the authority. The previous papers and model papers are also available for download in the official website. Candidates are advised to download the previous papers and model papers and work on them to attain good score in the written exam.